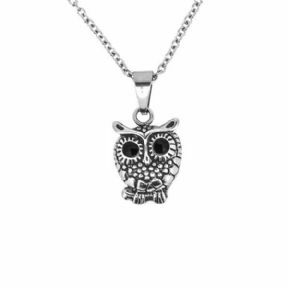 A highly attractive Owl Pendant, inspired by books such as the "Harry Potter" series. Crafted in the finest 316L Stainless Steel, it comes complete on a black leather necklet, and is shipped complete in an attractive black box. It is despatched to you direct from our showroom in the heart of Edinburgh's famous Royal Mile. It will make an ideal gift, and a lasting memento, for yourself or for someone you love. Size (approx) - 30.0mm x 17.0mm. Is this a gift? Why not include a personalised gift card. We will handwrite your greetings in a lovely colour greeting card featuring a beautiful Scottish scene. Simply select the option above, and then enter what you want written in it.